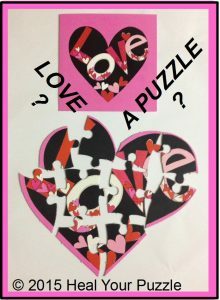 Heal Your Puzzle » Blog Archive » Love… Do you know that you Attract All your Experiences like a Huge Magnet? Love… Do you know that you Attract All your Experiences like a Huge Magnet? Back in 2012…”Love and its Many Faces” was about the Heart Chakra being our Centre and that Love is the most complex emotion we have, ranging from all that is physical reality – our bodies, health, relationships – to all that is spiritual – inner peace and happiness, personal growth and understanding, aspirations and goals… and as such, the Feeling of Love can be one of the most powerful driving Forces in our lives. 2013… “Looking for New Opportunity? New Job? New Love?” talked about the flow of your natural energy and how life may sometimes flow well or sometimes feel interrupted but for life to work out in a way that you love, honest clarity about your Life and your Goals is fundamental. 2014… “Stepping Outside Your Comfort Zone? Exhilarated or Frightened?” looked at how we experience events and how it affects us. It brought in the idea of multi-dimensional perception and that your Body, your Mind, your Deeper Consciousness may all experience things differently. Only coherence of your whole Being, the holistic approach, will bring resolution and heal that inner feeling of discomfort. And now into 2017… our Magnetic Presence forms from all our physicality, all our thoughts and perceptions, all our feelings about everything, all that we have inherited and acquired. This Presence is what attracts experiences to us and draws us to people and situations and also repels – keeps these away! Your Life is driven from here! If you want to change your Life, maybe you have tried and got frustrated, and maybe you dream of a Greater Life Journey towards more deeply empowering and fulfilling connections and experiences, the ultimate Love Vision, you will need to take responsibility for your Magnetics.